Save every scene in natural beauty. 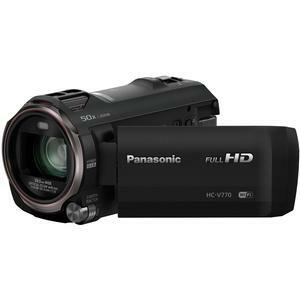 The Panasonic HC-V770 Wireless Smartphone Twin Recording Wi-Fi HD Video Camera Camcorder lets you catch the scenes you want with easy zooming and excellent quality. 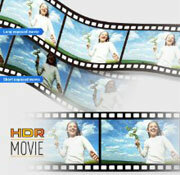 Use the world's first HDR (High Dynamic Range) Movie technology to get clear shots even with backlighting. And take sub camera shots with a smartphone. The BSI sensor, which features 6.0MP pixels, and the high-speed Crystal Engine, capture crisp, clear pictures. HYBRID O.I.S. + uses five-axis correction to thoroughly suppress blurring all the way from wide-angle to powerful zoom shots. The wind shield zoom microphone capture clear audio. iA (intelligent Auto) senses the shooting conditions and automatically makes the settings and activates functions that deliver optimal results. By pushing or rotation the manual dial, you can easily adjust allocated function, like focusing and changing the iris. The Wi-Fi function enables easy connection, remote shooting, and sharing with smartphones. The lens system drives each of four lens groups separately, reducing the drive ranges to result in high image quality, high-powered zooming, and a compact camera body. This combines with the BSI sensor, which features 6.0MP effective pixels, and the high-speed Crystal Engine, for crisp, clear pictures. By combining two images taken with different exposure times, the HDR Movie function suppresses blown highlights and blocked shadows for crisper, clearer videos. 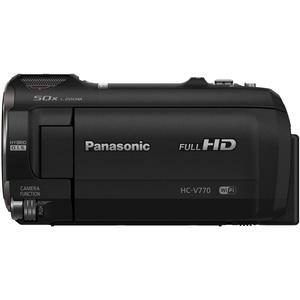 This is the world's first consumer camcorder to feature the HDR Movie function. Even in difficult shooting situations, such as backlighting, you can easily capture natural videos with excellent gradation. By driving each of four lens groups separately, the drive ranges are reduced, resulting in high image quality, high-powered zooming, and a compact camera body. 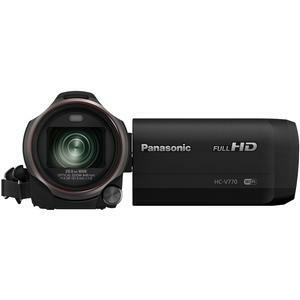 This keeps the body compact even with a 20x optical zoom. The Back Side Illumination Sensor has a large effective area with 6.03M effective pixels, suppressing noise even when shooting in dimly lit places, such as indoor scenes or nightscapes. It achieves stunningly beautiful images even down to the tiniest details. 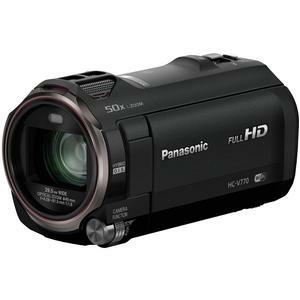 Panasonic's unique, high-speed engine lets you shoot and play smooth Slow Motion Video in Full-HD. Its Noise Reduction function reduces noise for crisp, vibrantly colorful Full-HD images. Wind Shield Zoom Microphone: A special damping material is provided in the space between the mic and the mic net to suppress wind noise for clear recording always. High-Quality Audio Parts: Four 6mm-diameter, high-S/N mics and aluminum electrolytic capacitors reduce sound distortion and increase clarity. Records Full-HD (1920 x 1080) at 120 fps. And the Intelligent Frame Creation of the Crystal Engine interpolates to an equivalent of 240 fps, for smooth slow motion. 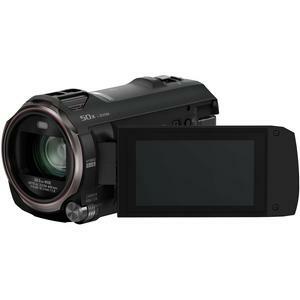 Switches to slow motion while you touch the icon on the LCD screen during shooting. Filter effects -- Miniature Effect, 8mm Movie, Silent Movie and Time Lapse Recording -- make it possible to shoot impressive video recordings that are matched to the shooting situation. The Wi-Fi function enables easy connection, remote shooting, and sharing with smartphones. Remote Shooting: The "Panasonic Image App" lets you use a smartphone or tablet as a live-view remote controller and operate the camcorder from a distance. Real Time Broadcasting: You can deliver important events, like a wedding, in Full-HD quality using the USTREAM video service to share the images with friends all over the world in real-time. Remote View: Videos and photos inside the camera can be viewed on a smartphone or tablet, and uploaded to an SNS site. 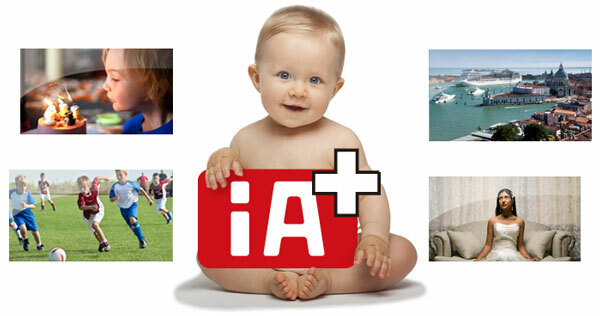 Baby Monitor: You can check on the baby with a smartphone or tablet in another room. The Push Notification function alerts the smartphone or tablet if a voice sensor detects the baby waking up and crying. Home Monitoring: When you are away from home, you can monitor and record there with high-quality live video, and speak to your family or pets using your smartphone or tablet. 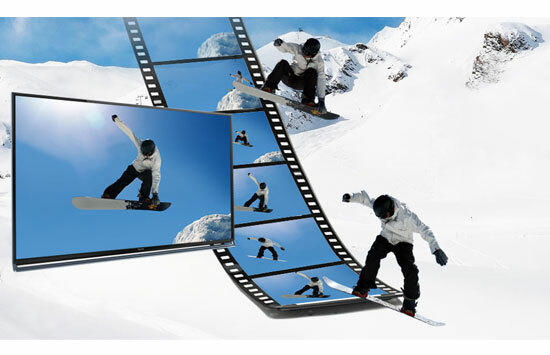 Highlight Playback and Easy Share: You can enjoy Highlight Playback with a smartphone or tablet right after shooting. Favorite scenes can be shared on SNS with simple drag and drop operation. Auto Transfer (Wireless PC Copy): Images are transferred from your camcorder to a computer via the wireless access point at home. Wireless TV Playback: An access point at home can be used to transfer data wirelessly to the TV or a tablet in the living room, or other rooms in the house. You can play images on the large-screen display.